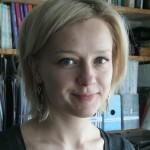 Agnieszka Szarkowska, PhD, is an assistant professor at the Institute of Applied Linguistics at the University of Warsaw. Her research interests include audiovisual translation, especially audio description and subtitling for the deaf and hard of hearing. Freelance translator and subtitler. She is also a member of ESIST and honorary member of the Polish Audiovisual Translators Association (STAW). - Krejtz, Izabela, Agnieszka Szarkowska, Agnieszka Walczak, Krzysztof Krejtz, Andrew Duchowski (2012) “Audio Description as an Aural Guide of Children’s Visual Attention: Evidence from an Eye-Tracking Study.” ETRA 2012. - Szarkowska, Agnieszka, Krejtz, Izabela, Kłyszejko, Zuzanna & Wieczorek, Anna (2011) “Verbatim, standard, or edited? Reading patterns of different captioning styles among deaf, hard of hearing, and hearing viewers”. American Annals of the Deaf 156 (4), 363-378. - Szarkowska, Agnieszka (2011) “Text-to-speech audio description: towards wider availability of AD”. Journal of Specialised Translation 15, 142-163. Szarkowska Agnieszka (2010) “Accessibility to the Media by Hearing Impaired Audiences in Poland: Problems, Paradoxes, Perspectives”. In: Jorge Díaz Cintas, Anna Matamala and Josélia Neves (eds) New Insights into Audiovisual Translation and Media Accessibility. Media for All 2. Rodopi: Amsterdam – New York, 139-158.